The prefix “trans” reminds us that the concept of crossing is fixed at the heart of translation. Thinking about translation in this way—as a crossing, a kind of movement—suggests a rich intersection of questions about the nature of the translator's work. Translation & Crossing asks us to think about physical crossings and migrations, the potential upheaval and labor that this physical movement implies, as well as the complex linguistic transfer that occurs in translation between languages and cultures. But translations can and often do cross much more abstracted terrain—what does it mean for a translation to traverse ideologies, time periods, forms, genders, artistic and intellectual boundaries of all kinds? What strategies, practices, and transgressions emerge in this process of moving across these more ambiguous divides? 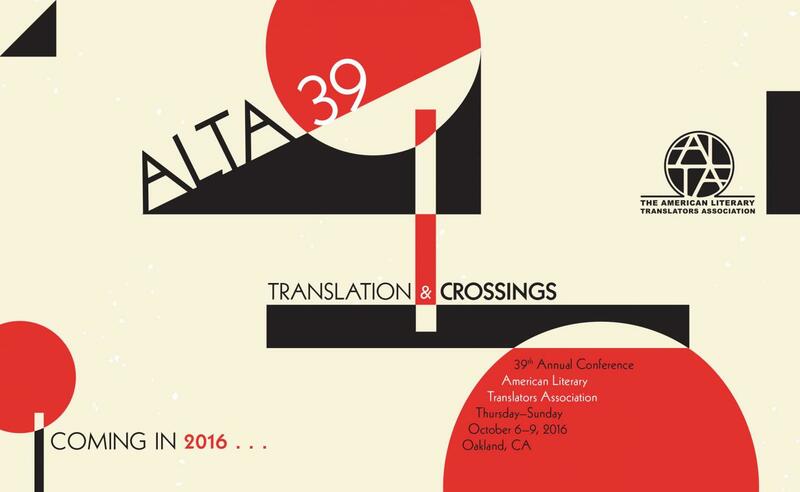 ALTA39 aims to create an inclusive venue for conversation about translation as a process of moving across, through, over, to the other side of, or beyond these categories and boundaries. Conference sessions begin at 8:00 a.m. on Friday, October 7, 2016, and conclude at 5:15 p.m. on Sunday, October 9, 2016. There is an opening reception at 5:00 p.m. on Thursday, October 6, 2016. There is a closing reception at 5:30 p.m. on Sunday, October 9, 2016.